It's no secret I love Danganronpa. These visual novels are not just entertaining, darkly humourous whodunnint murder mysteries. 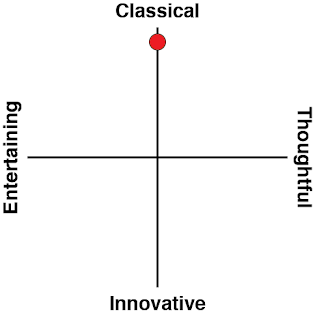 They're also intelligent and insightful games that look at a host of interesting philosophies and themes, from game theory to moral relativism. Wrap that up in some light fan service and hugely charismatic characters (not least of which the "antagonist," Monokuma), and you've got a recipe for a series that I'll always have time for. And Danganronpa V3: Killing Harmony takes things to another level entirely. It's difficult to talk about these games in the context of a review, as the publisher swears us to secrecy regarding plot spoilers. That makes sense, of course, given that the games are all about the twists and big reveals, and I wouldn't want to spoil them for players anyway. In previous reviews I've addressed various key themes that the games explore, which I won't run over again (please read my reviews of Danganronpa and Danganronpa 2 for that). But I can talk about the first chapter, which I will, because, while there are some spoilers in that, it's only a tiny part of the overall game, and is emblematic of what to expect from the whole game. 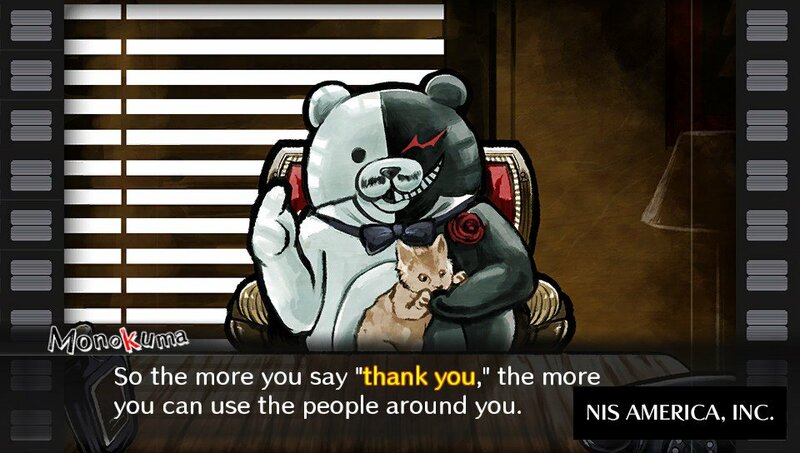 What I can say is that this new game is a slightly less nuanced experience from the perspective of Monokuma himself. The basic set-up for the game is the same: sixteen young people have been captured and imprisoned in an area in which none of them can leave unless one of them kills another and isn't caught by his or her "classmates." 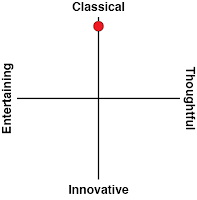 Related reading: More reviews! Matt's coverage of the remaster of Danganronpa 1 & 2 for PS4. The difference is that Monokuma - the villain that imprisons the characters - is more aggressive this time around. In previous Danganronpa games there was the promise that the 16 prisoners of his deadly "game" could survive indefinitely in harmony with one another as long as they didn't kill one another (they'd be prisoners, but their every need was provided to them, and they'd be completely safe in the prison, making for an odd utopia). In Danganronpa V3, Monokuma makes it explicitly clear that the kids will need to start killing one another, threatening to kill them all if a deadline for the first murder isn't met. It's a subtle shift, but it pushes Danganronpa V3 a little away from the game theory social commentary of the first two games, and into a Battle Royale-style social commentary instead. There's still a deep exploration of the human condition in there, but there's a greater sense of desperation among the characters as they participate in the "game" this time around, which replaces the tone of reluctant tragedy of the predecessors. What Danganronpa V3 does incredibly well is play within the detective genre, and indeed contains one of my favourite twists that was pioneered by Agatha Christie back when, and manages to get me every time. Anyone who has read The Murder of Roger Ackroyd will know what I'm talking about, without giving away anything. Christie's technique is only used in one particular section of the game, but it was certainly unexpected, and after having played through the first two Danganronpa games - and getting fairly good at guessing the logic behind the murders by the end of the second - it came as a welcome surprise that I was left guessing as to who did what and how with this one. The game's ability to keep you on your toes makes Danganronpa V3 the digital equivalent of a page turner. It's hard to put down. It's a lengthy grind of a game - feeling even longer and more in-depth than its predecessors, but like a really good book, that time just flies as you play. If I'm splitting hairs I'd say the location of this prison itself - an old, abandoned school and its surrounding gardens - isn't as exotic or interesting as Danganronpa 2's tropical island, and there are some superficial elements that don't do much to enhance the game. There's a casino, for example, where you can gamble away to earn prizes, which is a distraction that pulls players out of the narrative for far too long. There's also some odd minigames, which, again, don't do anything to enhance the core plot. Early on, for example, the characters discover a pipe that they think might be an escape. Attempting that pipe takes you to the hardest 2D platformer you'll ever play (I'd be surprised if it's actually possible to get to its end), and the end result is the characters fail and then we cut back to the "story," with them looking miserable about it. I appreciate that the development team at Spike Chunsoft wanted to appeal to a broader audience - the kind of audience that think visual novels are "not interactive enough" and therefore "bad," but these minigames don't help build character or tell us anything that standard text wouldn't have (i.e. "we tried to escape via the tunnel but failed"), and I find them detrimental to the flow of the storytelling. Speaking of minigames, the place where they are appropriate is the court cases. 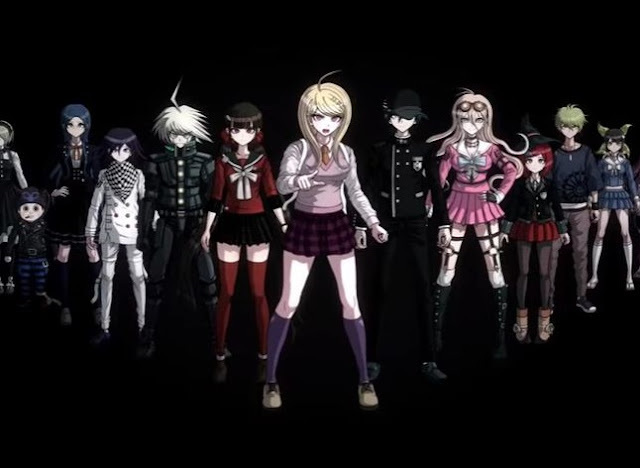 As with the previous two Danganronpa games, when one character murders another, a courtroom scene occurs, where the survivors try and figure out whodunnit. These scenes feature a half dozen or so different minigames, which boil down to you refuting the statements of the other characters, catching out lies, and coming to startling realisations regarding the clues left at the scene. These minigames are mostly enhancements on what has come previously, and they work quite well, and are appropriate to the narrative of the game; the goal being to get players feeling like they're contributing to the to-and-fro of the debate, rather than simply reading through it. These court scenes are the only place where it's possible to get a "game over" (though the difficulty is set generally quite low, and a retry doesn't drop you back more than a couple of minutes of play), and it has always been the only "interactivity" that Danganronpa actually needs. So with the only addition to the "gameplay" being some ill-advised minigames, is Danganronpa V3 a step back for the series? No, not really. It's the best of the lot, and that's entirely because of the game's strength; its characters. A more eclectic bunch of delightful weirdoes has never been seen in a game before. Both the previous Danganronpa games had delightful characters of their own - and I'll forever love Kirigiri above all - but in this one I found that I wasn't really ambivalent about any of the characters at all. I either loved them, or I loved to hate them. Real standout highlights for me included the Internet troll personified, Kokichi Oma, a sarcastic trashfire that throws a tantrum about how mean people are being to him the moment someone calls him out on his crap, Miu Iruma, the most amazingly gutter-mouthed woman whose singular skill was making my eyes widen further every time she said something, and Angie Yonaga, the artist/ religious devout who was just plain weird. Related reading: Matt's review of Another Episode, the action spin-off, for PlayStation 4. None of the characters belong to particular cliches (or do things to show that they're a deconstruction of that cliche), with the exception perhaps of Gonta Gokuhara, who channels Of Mice And Men's Lenny a little too perfectly, but they're a fascinating bunch. Equally importantly, the way they play off one another is brilliant, with just the right mix of humour and antagonism back and forth to convince you that they're all friends working together in a dire situation, but none of them really like one another. The other major new characters are Monokuma's "cubs" - five other bears that, like Monokuma, have a white/colour contrast design, though each of these characters have distinct personalities - one's a rocker, the other's an innocent girl, and a third's a toy robot design. The actual narrative value of these characters is minimal at best for the most part, but their interplay with Monokuma and the human characters generally forms the bulk of the comic relief, and there's a fair amount of fourth-wall breaking humour that comes from these interactions. 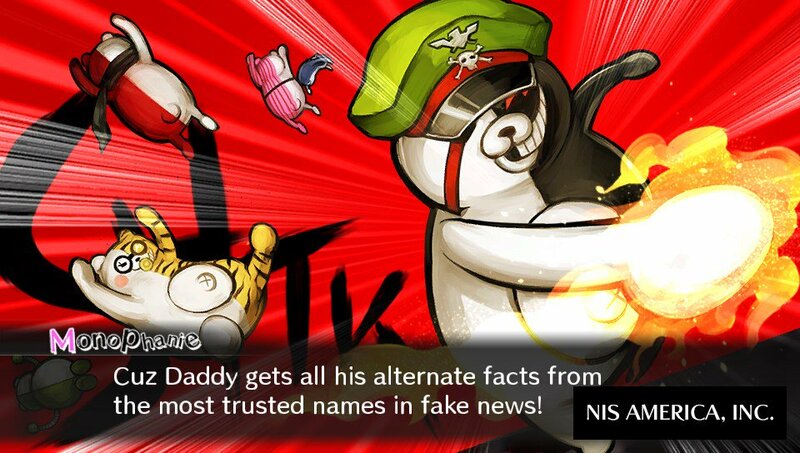 Like a good episode of the Simpsons, or any other self aware semi-satirical work, there aren't many punches that Danganronpa V3 pulls when it comes to pop culture references, be that classics like The Godfather, current crazes such as Yokai Watch (remembering that this is a Japanese game, and remembering how big that is in Japan), right through to the current political environment. It takes a while to adjust to these additions. I wasn't necessarily sold on the game at all at first - my first comment to the others on the DDNet team was that it's an "interesting game," without really being able to qualify if that "interesting" was a positive or not. But, as the characters grew on me, and the broader narrative pieces started to fall into place, I realised that the game's overall energy - more bombastic and sharper, for all its length - made for a more refined and confident narrative experience. The only thing that I can say categorically disappoints me is the voice acting. There's no Japanese voice track, or I somehow missed it despite puttering around in the settings for ages trying to find it. The English voice for the human characters do a decent enough job, though I can't compare to the Japanese actors, but Monokuma himself is ear-piercingly bad in English, and a very far cry away from the cutesy menace that the voice of Doraemon (Nobuyo Oyama) originally lent the character. Does he ruin the actual game on me? No, I can look past the voice acting because the story is so immersive, but that English voice actor has absolutely no idea what made Monokuma such an intense, brilliant character in the early games, and I'm not happy with NISA for allowing this to happen in localisation at all. Edit - I've been informed that there will be a day one free download with the Japanese voice track for the game, as file size restrictions mean dual audio couldn't be squeezed onto the initial download. Not that this affected the overall review on any level, but it's good to know my one complaint of any substance will be dealt with by the time the game is released. In the end I took Danganronpa V3 to be more of a Agatha Christie or Edogawa Ranpo-style detective story than I did in the previous two games. Danganronpa and its sequel were, to me, philosophical puzzle boxes, with that detective fiction sitting on the top to give it all context. This new game has veered a little away from the straight-up intellectualism, perhaps, but while I question some of the more superficial decisions that were made in development, that core mystery narrative is so classically entertaining as an example of the genre that I was simply unable to put this game down. It's a good thing that Danganronpa V3 has its own identity; it means the franchise as a whole is easily avoiding becoming stale. Keep me guessing, Spike Chunsoft, and I'll forever love you for it.